It’s the day before Halloween and Sandy has either continued or stopped causing destruction across the east coast. It has been quite a couple of days of rain and wind, with many affected by these actions. 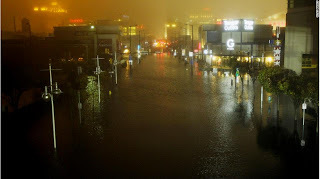 Home have been destroyed, flooding has made roads inaccessible, flights to the east coast are continually cancelled, and many children whose Halloweens have been compromised for the second straight year. Schools where Sandy had hit most continue their cancellations to possibly the end of the week with all the damages done to surrounding areas that obstruct students’ means of transportation. Just where I’m from, the damage was limited to minor flooding and some major power outages across the county. There are people I know who still wait for their power to return. Other than that, the second day of Sandy was not bad. The sun broke out at times, and the weather was warm, if not a little humid. There was a little rain here and there and also the mini storm just a little while ago. Though the damage around me was minimal, it doesn’t mean that everyone else had the same luck. So hopefully those areas will be able to get back up and running soon, because winter is coming, and who knows what that brings. Also, to those students who complained that school didn’t get cancelled for a second day, you really should have looked at the weather today. It was nice. Yes, I understand that your area was probably affected by the storm and you couldn’t make it to school. You shouldn’t complain that school is still in session even though your town is a mess. Just don’t go to school. You are old enough to make the informed decision to be safe. The school is open because it deemed the weather and facilities were operational enough to hold classes for those students on or off campus. The school will never put themselves over your safety, because that would just be ridiculous. Happy Halloween to those who will be able to have it tomorrow, and hopefully those whose Halloweens are ruined will still be able to enjoy it. Now I will sit and ponder as to why Assassin’s Creed III still hasn't arrived to my house yet. It’s probably storm related for all I know.